A G6 is a Gulfstream business jet with a top speed of Mach 0.925. 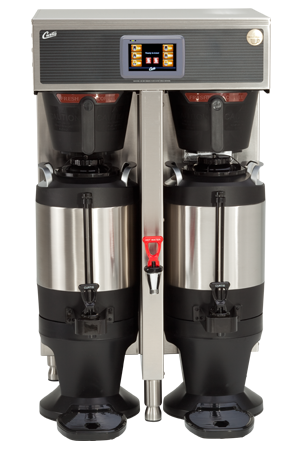 The Curtis G4 is the equivalent in the coffee making world, capable of a top speed of up to 302 cups of coffee per hour. A 4.3 inch touch screen controls the hot brewing action. Twin servers keep brewed coffee ready to serve jet-setters and homebodies alike. Faster Than The Speed of Light - Not actually, but this machine quickly produces large quantities of delicious coffee. You've got the Power! - This is one high powered, high quality machine, designed for years of heavy duty use. Additional Items Required - This coffee brewer does not come with servers. They are sold separately, which increases the initial investment.